Odin (pronounced “OH-din”; Old Norse Óðinn, Old English and Old Saxon Woden, Old High German Wuotan, Wotan, or Wodan, Proto-Germanic *Woðanaz, “Master of Ecstasy”) is one of the most complex and enigmatic characters in Norse mythology, and perhaps in all of world literature. He’s the ruler of the Aesir tribe of deities, yet he often ventures far from their kingdom, Asgard, on long, solitary wanderings throughout the cosmos on purely self-interested quests. He’s a relentless seeker after and giver of wisdom, but he has little regard for communal values such as justice, fairness, or respect for law and convention. He’s the divine patron of rulers, and also of outlaws. He’s a war-god, but also a poetry-god, and he has prominent “effeminate” qualities that would have brought unspeakable shame to any historical Viking warrior. He’s worshiped by those in search of prestige, honor, and nobility, yet he’s often cursed for being a fickle trickster. What kind of literary figure – let alone a god whose historical worship spanned much of a continent and several centuries – could possibly embody all of these qualities at once, with their apparently glaring contradictions? This ecstasy that Odin embodies and imparts is the unifying factor behind the myriad areas of life with which he is especially associated: war, sovereignty, wisdom, magic, shamanism, poetry, and the dead. In keeping with his associations with sovereignty (see below), Odin doesn’t generally concern himself with average warriors, preferring instead to lavish his blessings only on those whom he deems to be worthy of them. Many of the greatest Germanic heroes, such as Starkaðr and the Volsung family, have enjoyed Odin’s patronage. He maintains particularly close affiliations with the berserkers and other “warrior-shamans” whose fighting techniques and associated spiritual practices center around achieving a state of ecstatic unification with certain ferocious totem animals, usually wolves or bears, and, by extension, with Odin himself, the master of such beasts. Thus, as a war-god, Odin is principally concerned not with the reasons behind any given conflict or even its outcome, but rather with the raw, chaotic battle-frenzy (one of the primary manifestations of óðr) that permeates any such struggle. Odin’s preference for the elite extends to all realms of society. As the chief of the Aesir gods, he’s the divine archetype of a ruler. He’s the legendary founder of numerous royal lines, and kings are as likely as shamanistic warriors to claim him as their beneficiary. The Germanic peoples, like other Indo-European peoples, originally had a three-tiered social/political hierarchy: the first tier consisted of rulers, the second of warriors, and the third of farmers and others occupied with production and fecundity. The gods and goddesses can be profitably mapped onto this schema, and Odin, along with Tyr, corresponds to the first tier, the rulers. The crucial difference between Tyr and Odin in this regard, however, is that Tyr has much more to do with rule by law and justice, whereas Odin has much more to do with rule by magic and cunning. Tyr is the sober and virtuous ruler; Odin is the devious, inscrutable, and inspired ruler. Paradoxically, Odin is often the favorite god and helper of outlaws, those who had been banished from society for some especially heinous crime, as well. Like Odin, many such men were exceptionally strong-willed warrior-poets who were apathetic to established societal norms – Egill Skallagrímsson (Egil’s Saga) and Grettir Ásmundarson (The Saga of Grettir the Strong) are two examples. The late twelfth/early thirteenth-century Danish historian Saxo Grammaticus even relates a tale of Odin being outlawed from Asgard for ten years so that the other gods and goddesses wouldn’t be tarnished by the vile reputation he had acquired amongst many humans. Whatever their social stature, the men and women favored by Odin are distinguished by their intelligence, creativity, and competence in the proverbial “war of all against all.” Whether such people become kings or criminals is mostly a matter of luck. One of the greatest differences between monotheistic theologies and polytheistic theologies is that, in the former, God is generally all-knowing, all-powerful, all-loving, etc. Polytheistic gods are none of these things; like any human, tree, or hawk, they are limited by their particularity. For Odin, any kind of limitation is something to be overcome by any means necessary, and his actions are carried out within the context of a relentless and ruthless quest for more wisdom, more knowledge, and more power, usually of a magical sort. One of the most striking attributes of his appearance is his single, piercing eye. His other eye socket is empty – the eye it once held was sacrificed for wisdom. From a work to a work I was led to a work. Odin’s competitive side once drove him to challenge the wisest of the giants to a contest to see who was more knowledgeable and learned. The prize was the head of the loser, and Odin won by asking his opponent something that only he himself could know. Odin then claimed his prize and returned to Asgard. Along with Freya, he’s one of the two greatest practitioners of shamanism amongst the gods. His shamanic spirit-journeys are well-documented. The Ynglinga Saga records that he often “travel[s] to distant lands on his own errands or those of others” while he appears to others to be asleep or dead. Another instance is recorded in the Eddic poem “Baldur’s Dreams,” where Odin rode Sleipnir, an eight-legged horse typical of northern Eurasian shamanism, to the underworld to consult a dead seeress on behalf of his son. Odin, like shamans all over the world, is accompanied by many familiar spirits, most notably the ravens Hugin and Munin, the wolves Geri and Freki, and the valkyries. The shaman must typically undergo a ritual death and rebirth in order to acquire his or her powers, and Odin underwent exactly such an ordeal when he discovered the runes. We’ve already, albeit briefly, discussed the berserkers and other distinguished “warrior-shamans” under Odin’s patronage. This was the form of Germanic shamanism that was the most socially acceptable for men to practice. The other main form of Germanic shamanism is contained within the magical tradition known as seidr, of which Odin and Freya are the foremost divine practitioners. In traditional Germanic society, for a man to engage in seidr was effectively to forsake the male gender role, which brought considerable scorn upon any male who chose to take up this path. As the sagas show, this didn’t stop some men from practicing seidr anyway. However, even Odin wasn’t exempt from such charges of “unmanliness,” and was taunted for adopting the feminine traits and tasks that form part of the backbone of seidr. Saxo, in the passage on Odin’s exile alluded to above, relates that “by his stage-tricks and his assumption of a woman’s work he had brought the foulest scandal on the name of the gods.” Note also the reference to being “fertilized” in the verse quoted above – while this is certainly a metaphor, it’s a metaphor loaded with sexual implications that would have been immediately recognizable to any Viking Age or medieval reader or hearer of the poem. 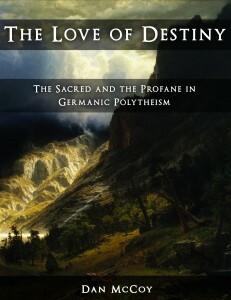 A fuller discussion of the relationship between Germanic shamanism and gender roles can be found here. For our present purposes, it’s sufficient to point out that, in the eyes of the pre-Christian northern Europeans, Odin’s practice of seidr made him a rather “unmanly” being incapable of fulfilling the expectations placed upon an honorable man. But we’ve already noted Odin’s scant concern for honor. He isn’t one to refuse any ecstatic practice, even those that bring him ill repute. Odin speaks only in poems, and the ability to compose poetry is a gift he grants at his pleasure. He stole the mead of poetry, the primeval source of the ability to speak and write beautifully and persuasively, from the giants. Ever since, he has dispensed it to certain gods, humans, and other beings whom he deems worthy of it. The mead’s Old Norse name is Óðrœrir, “The Stirrer of Óðr,” and, as we have seen, óðr (“ecstasy, fury, inspiration”) is the root of Odin’s name as well. This intoxicating drink, along with the power it grants, is yet another manifestation of his overflowing ecstasy. He was a frequent recipient of human sacrifice, especially of royalty, nobles, and enemy armies. This was generally accomplished by means of a spear, a noose, or both – the same manner in which Odin “sacrificed himself to himself” (Old Norse gefinn Óðni, sjálfr sjálfum mér) in order to acquire knowledge of the runes. A common – and chilling – way of securing his favor in battle was to throw a spear over one’s foes, sacrificing them to the god with the cry, “Odin owns ye all!” (Old Norse Óðinn á yðr alla). His mastery of necromancy, the magical art of communicating with and raising the dead, is frequently noted. While there are several reasons Odin maintains this commerce with the dead, including his desire to learn what knowledge and wisdom they possess, the most significant reason is his dread-driven desire to have as many of the best warriors as possible on his side when he must face the wolf Fenrir during Ragnarok – even though he knows that he’s doomed to die in the battle. 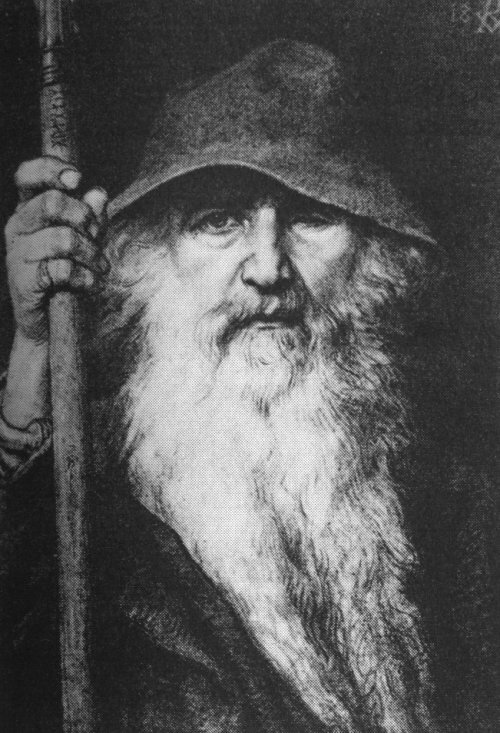 One of Odin’s countless names is “Allfather” (Old Norse Alfaðir), “because,” according to Snorri Sturluson, “he is the father of all of the gods.” And, as we’ve already noted, Odin is listed as the divine ancestor of countless families from all over northern Europe. He’s simultaneously an Aesir god, a Vanir god (the Vanir god Odr is only an extension or transposition of Odin), and a giant (his mother is Bestla, one of the first frost-giants). One Old Norse poem even identifies him with önd, the breath of life. What can we discern in all of this regarding Odin’s identity? In the same way that Thor is the divine force whose presence the Vikings felt in the thunder, Odin is the divine force whose presence the Vikings felt in óðr. 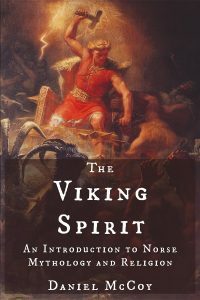 To them, this inspiration/fury/ecstasy was not a profane phenomenon, but a sacred and even divine one that lay at the heart of countless different undertakings, including many that were both especially rarefied and especially decisive in the Vikings’ lives. This is perhaps why Odin is the chieftain of the gods – the realms of life over which he presided were to the other aspects of life what a ruler is to common people. The Norse saw their gods as the vital forces that held the cosmos together. As the “Allfather,” Odin was the vital force of vital forces – the “breath of life,” or something almost akin to Nietzsche’s “Will to Power.” It’s surely no accident that Odin played a greater role than any other god in the creation of the world. Without his vivifying ecstasy, and the enchantment, insight, and clarity that it brings, life – and in particular a life worth living – would be impossible. Adam of Bremen. c. 1080. History of the Archbishops of Hamburg-Bremen. Translated by Francis Joseph Tschan. p. 207. Snorri Sturluson. Ynglinga Saga 6. In Heimskringla: eða Sögur Noregs Konunga. Turville-Petre, E.O.G. 1964. Myth and Religion of the North: The Religion of Ancient Scandinavia. p. 50-52 and references therein. Nietzsche, Friedrich. 1954. Thus Spoke Zarathustra: a Book for All and None. In The Portable Nietzsche. Edited and translated by Walter Kaufmann. p. 159. Turville-Petre, E.O.G. 1964. Myth and Religion of the North: The Religion of Ancient Scandinavia. p. 56, 70. Dumézil, Georges. 1988. Mitra-Varuna: An Essay on Two Indo-European Representations of Sovereignty. Translated by Derek Coltman. Dumézil, Georges. 1973. Gods of the Ancient Northmen. Edited by Einar Haugen. p. 46. Saxo Grammaticus. The History of the Danes. Snorri Sturluson. Ynglinga Saga 7. In Heimskringla: eða Sögur Noregs Konunga. Eliade, Mircea. 1964. Shamanism: Archaic Techniques of Ecstasy. Translated by Willard R. Trask. p. 380. The Poetic Edda. Baldrs Draumar. Eliade, Mircea. 1964. Shamanism: Archaic Techniques of Ecstasy. Translated by Willard R. Trask. p. 6. See, for example, Tacitus’s Germania. Turville-Petre, E.O.G. 1964. Myth and Religion of the North: The Religion of Ancient Scandinavia. p. 42-50. See, for example, Ynglinga Saga 7 and Hávamál in The Poetic Edda. Snorri Sturluson. The Prose Edda. Gylfaginning. The Poetic Edda. Völuspá 18.